We love building custom WordPress themes. We enjoy the fun and challenge of communicating a company’s identity through their web design. It was particularly intriguing when Hand in Hand ABA approached us with their website needs. Early on, it was decided that we needed a professional-looking kids WordPress theme. We worked with our preferred design partnered, Collaborative Thought, to develop a delightful custom kids WordPress theme. Rounded corners, a soft pastel colour palette, and child-like fonts (though no Comic Sans in sight! ), helped to create the look Hand in Hand were seeking. The design is unified and enhanced through the use of high quality professional images. As per Hand in Hand’s requirements, we incorporated easy access to the consultancy’s social media outlets and configured a company blog to facilitate the addition of new, high quality content on an ongoing basis. 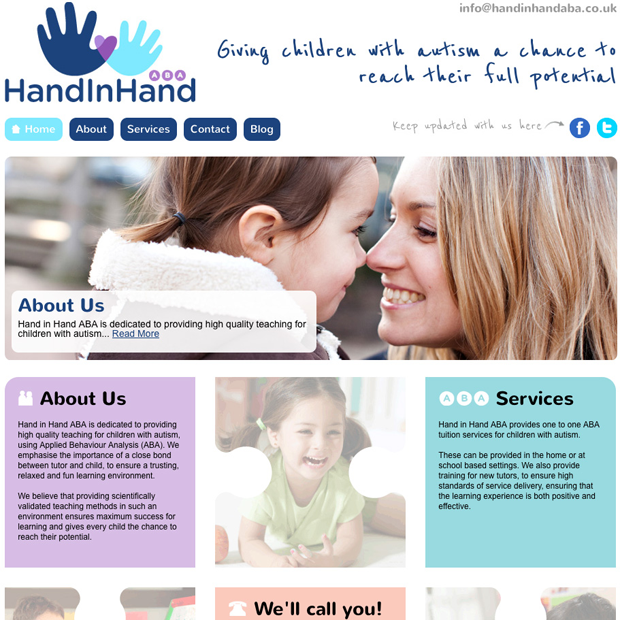 After a year of trading, Hand in Hand decided to launch a complementary ecommerce site, providing essential toys, tools and aides for working with children and adults with autism. We got to work on developing Treezy. While the Treezy design stands on its own an represents a fully bespoke kids PrestaShop theme, the design was also developed to reflect and harmonise with the Hand in Hand kids WordPress. Design elements from the Hand in Hand website were carried over to the Treezy ecommerce site, such as heading fonts, rounded corners, and bold use of colour. It was a pleasure working with Hand in Hand/Treezy and we relish the chance to collaborate with passionate entrepreneurs like these folks. The owners of Hand in Hand ABA and Treezy have identified a well-defined niche and they know ‘who they are’ as a business. As parents of a child with autism they are more than just professionals in this area, they are extremely committed to their business on a very personal level. While it would be great to see more posts on the Hand in Hand blog, those that have been published are very high quality and clearly demonstrate the owner’s enthusiasm and expertise. This clear identity and focus on a well-defined niche and community of customers helps both their website and ecommerce site stand out from their competitors online. Need a kids WordPress theme for your website? Does your business offer products and services for children and families? We would be delighted to put our experience building kids WordPress themes to work for you. Get in touch and let’s work together.